Austrian full service provider Light and Sound has provided an L-ACOUSTICS KARA/KIVA WST® line source system for the 1st Winter Youth Olympic Games in Innsbruck. 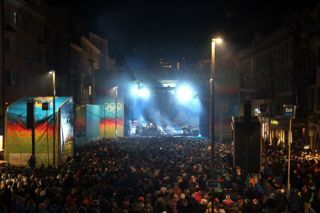 Innsbruck’s city center was transformed into a party zone for the 2012 Games, with an action-packed program taking place at Medals Plaza, which hosted not only the daily Victory Ceremonies but also the week-long Innsbruck 2012 Music Festival. The challenge was to find a good setup for the wide ranging styles of music performed – from Austrian folklore and folk music through to hip hop, rock acts and the daily Victory Ceremonies – while also taking into account the 90dB limit set by the city. Light and Sound made use of L-ACOUSTICS’ SOUNDVISION 3D acoustic simulation program to create a KARA/KIVA system that provided optimal sound and speech intelligibility at every listening position. The main system consisted of nine KARA cabinets for left and right hangs, four L-ACOUSTICS SB28 and four SB18 subwoofers for each side, and four 12XT coaxials for infill and outfill. Nine LA8 amplified controllers in LA-RAKs powered the system. The delay system consisted of seven KIVA cabinets and two KILO low frequency extensions for left and right hangs. A stage monitoring system of a dozen 115XT HiQ active monitors and three dV-SUBs was powered by eight LA8 amplified controllers also in LA-RAKs. "The KIVA/KILO system, with its excellent mid and high resolution, also delivers an amazing amount of sub-lows in proportion to its size. The built-in rigging is also a big plus, making both very quick and easy to set up. We are looking forward to many good shows with these amazing systems."